A Scarlet Tanager sings in a tree in Danbury, Conn., July 2016. Thankfully the trees are fully leafed out. My neighbors probably would have started to wonder about me. Of course, that process likely started long ago. I found myself standing on my roof, camera in hand, keeping an eye on a male scarlet tanager that was singing his heart out among the oaks. I had noticed the brilliant red-and-black bird a few days before. I was writing at my computer at home when I spied him through the window eating berries from those ubiquitous wild raspberry bushes, which are really invasive wineberries from Asia. The bird was impossible to miss with that beaming red plumage that puts cardinals to shame. (No offense to our beloved cardinals.) The tanager was gone by the time I opened the front door for a better look. On this day, however, he was back and tantalizingly close for good photos. He flew from oak tree to oak tree, never venturing far from the house. But, typical for a scarlet tanager, he was up too high. Here’s the point in the column where I feel the need to add a disclaimer. I don’t encourage the behavior I am about to describe and will not be held responsible for anyone silly enough to try to emulate it. The risk of damage to your camera is greater when shooting from a roof. Oh yeah, you can also hurt yourself. My roof happens to be fairly low (from one side anyway) and flatter than most roofs. Not that that makes it a wise decision to chase a bird up there, but it’s not like it’s one of those steep-pitched roofs 30 feet above the ground. Anyway, I grabbed the ladder, rested it against the gutter and started climbing, camera in tow. It’s not every day, or even every year, that a relatively tame scarlet tanager is hanging around your yard, so it was a risk worth taking. I got to the roof and listened for the current whereabouts of this shining star of the bird world. I heard the raspy robin-like song coming from an oak tree that grows in the front yard. It was mostly hidden among the leaves, however. Those same leaves that were shielding me from my curious neighbors were now similarly hiding my avian target. The bird suddenly darted from that tree and landed on a dead branch of an oak that grew in the back yard. It was a low dead branch and not completely covered by leaves. I was in luck. Finally. In all my years of thoroughly enjoying this hobby, never had I been so close to a scarlet tanager. The tanager did not pay any attention to me. It flew from perch to perch, singing his song and picking insects out of the air when one came close enough. The tanager’s song is so close to a robin’s that a few American robins flew in for a closer inspection. The tanager did not call, however, only sang. In addition to their song, scarlet tanagers also have an almost comical “chick-bree” call. I’ve heard it several times over the last few weeks, but I didn’t on this day. Even with the higher vantage point it was still difficult to photograph the bird. The leaves were a constant obstacle and the lighting was tough as the fading sun filtered through the branches. But I was still happy with the results. How could you not be happy with even average photos of a scarlet tanager? It’s such a show-stopping bird. It’s up there in flashiness with rose-breasted grosbeaks and Baltimore orioles, only even more spectacular. That’s my opinion anyway. The visit comes at a good time, too. The breeding season is over so I’m not sure why it’s singing so much. Soon this bird, and all male scarlet tanagers, will lose the brilliant plumage. In one of the most dramatic transformations in the New England bird world, the male scarlet tanager goes from dazzling red and black to a mostly drab yellowish green for the fall migration. The fall plumage of the male scarlet tanager closely resembles the year-round plumage of the female. In fact, I think the bird I saw has started the transformation already as a spot of yellow pokes through the bright red on the back of the head. (For more photos, see www.birdsofnewengland.com). I took enough photos to sink a ship — thank goodness for digital photography — and climbed down the ladder back to solid earth. I have to admit, though, my head was still a bit in the clouds after seeing that bird. 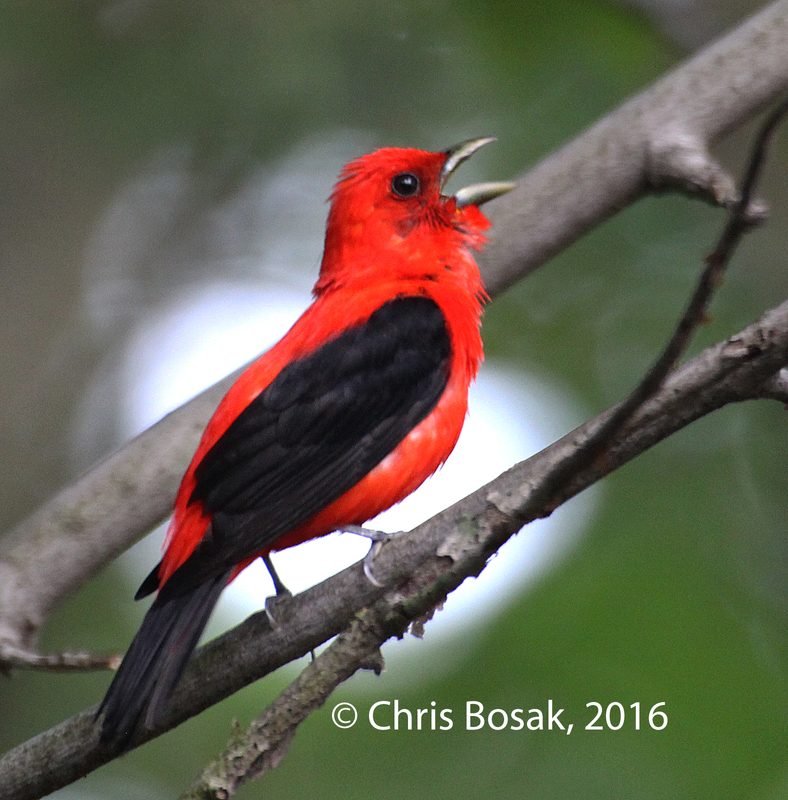 This entry was posted in backyard birding, Chris Bosak, For the Birds column and tagged birding columnist Chris Bosak, chris bosak's for the birds, Scarlet Tanager, Scarlet Tanager in New England, Scarlet Tanager singing by Chris Bosak. Bookmark the permalink.